LIFE AND TIMES Foxford’s JJ O’Hara is pictured here while filming the documentary on the River Parana In Argentina. AN Taoiseach, Enda Kenny is set to launch a new film about Ireland’s greatest naval hero, Foxford-born Admiral William Brown, whose exploits won independence for Argentina, and much of South America. Deputy Kenny will attend a special premiere of the hour-long documentary at the Royal Theatre, Castlebar on Monday, August 1 at 7.30pm. The film, which interweaves Brown’s story with that of Foxford native, the late JJ O’Hara, whose efforts to elevate the profile of Admiral Brown in Ireland, while forging and enhancing relationships with Argentina, are legendary. In Argentina, Brown is immortalised for the famous victories he won against the Spanish and Brazilian fleets, usually against overwhelming odds. Regarded as a national hero, in excess of a 1,000 streets, 400 statues, football teams, stadiums, schools, several towns, and a major city bear his name. However, for many years he was little known in his native land, an oversight which JJ O’Hara set out to rectify in an extraordinary campaign that lasted over a decade. In the process, JJ transformed his home town of Foxford and Ireland’s relationship with Argentina, helping hundreds of children there through charity work, while providing an inspirational role model for his fellow members of the Admiral Brown Society, who still carry on his work in the community. He drafted an ambitious 20 point plan and oversaw the implementation of 17 of its points, prior to his untimely death on August 13, 2008. Only three points remained, to be completed; a film about the life of Admiral William Brown, the provision of the Admiral William Brown Memorial Park, on a beautiful riverside site, along Green Road, Foxford, and the establishment of a English Language School/Cultural Centre, for Argentine students in the town. It is hoped that work will commence on the Admiral Brown Memorial Park in the near future, while the Admiral Brown Society is to examine the possibility of undertaking a feasibility study in relation to the English Language School / Cultural Centre, for the town. Gus O’Hara, Chairman of the Admiral Brown Society said: “My late brother JJ and the Timesnap crew invested a phenomenal amount of time and work into this documentary over seven years. It was one of the very few things he was involved in left unfinished so we knew it was important to get this extraordinary story out there both as a tribute to JJ and to tell the Brown story on film as he always wanted”. 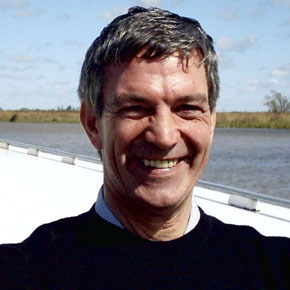 The documentary, entitled ‘JJ and the Admiral” follows JJ on one of his 18 trips to Argentina where he visits the scenes of Brown’s battles and journeys hundreds of kilometres up the Parana river, with the Irish Naval Service to deliver a badly needed generator to one of dozens of Argentine schools, named after Brown. Writer / producer, Bill Tyson and cameraman Declan Cassidy of Timesnap Productions spent four months in Buenos Aires researching the film, and uncovered new additional material in the Argentine archives. Film footage was shot in location in Foxford and Galway, while funding for the completion of the documentary was provided by the Admiral Brown Society, Foxford and Mhuintir Mhaigheo na Gailimhe, (the Galway Mayo Association). There is no admission fee to this special premiere of the film in the Royal Theatre, Castlebar on Monday, August 1, at 7.30 pm. and all are welcome. Copies of the documentary (DVD) and books pertaining to Admiral William Brown will be available for purchase at the event.